One of the all-time finest commodities from the 1930s and rarely seen in such high grade. 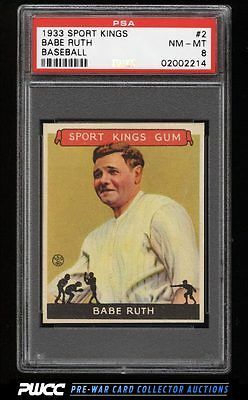 A wonderfully sharp and beautifully preserved Babe Ruth in stunning NM-MT condition. Simply not enough of these hobby critical investment pieces to go around; this comes with our highest recommendation. Part of a jaw dropping '33 Sport Kings set break on the auction block this month. This offering represents the current #1 finest '33 Sport Kings set on the PSA registry and is deserving of serious attention. One of over 11,000 cards, lots, and sets up for bid in our 9th Auction of 2016. Click on the link above to view the other PWCC auction lots.